Alpacas are a member of a family of animals known as Camelids which comprise Dromedary, Bactrian, Llama, Alpaca, Guanaco, and Vicuna. Originally from the Andes Mountains of South America (southern Peru, western Bolivia, Ecuador, and northern Chile), the alpaca is commonly thought to have been domesticated from the wild vicuna. 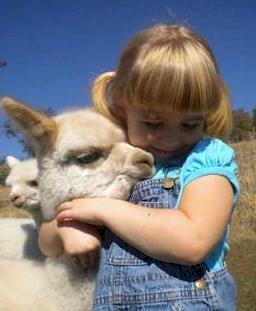 Alpacas are intelligent and easily trained animals, and gentle enough to be handled by children. They hum when pleased or happy and spit when they are not. They make very good pets and companion animals, but don't like being alone. Alpacas are also easy to care for, and gentle on pastures with their hoof-padded feet. The first alpacas are thought to have been developed about six thousand years ago. Mummified remains of alpacas from about a thousand years ago have been discovered in Southern Peru. Scientists, reviewing these well-preserved findings revealed that alpacas were recognized as a national treasure in South America. Many alpaca remains were buried in the floors of houses for prosperity, and offering to their Gods. Among the Andes people, the woven fabric from the fleece of the alpaca was so soft and alluring that it was used as currency. During the 17th Century Spanish Conquest in Peru, most of the alpacas perished, but the Quecha people of the Andes (mostly Peru) were able to prevent the alpaca's total extinction. For much of the 20th century exporting alpacas was prevented. Females start breeding at 2 to 3 years old. Their offspring, called cria, are born after an average gestational period of 11.5 to 12 months. Crias birth weight can range from 10-20 pounds and a newborn cria can stand 30 minutes to 1 hour after birth. Female adults typically wean their cria between 6 to 12 months. Human intervention and separation of mother and cria at 6 months is typical. Alpacas come in many different colors, including white, fawn, brown, grey, and blacks. Many are a solid color but some are spotted. They are intelligent, easily trained, and are often gentle enough to be handled by children. They hum when pleased or happy and sometimes spit when they are not. Alpacas are also easy to care for, and gentle on pastures with their hoof-padded feet. Their fiber has an absence of wool grease or lanolin that is characteristic of sheep. Alpaca fiber also retains dyes without losing its sheen and can be blended with other natural or synthetic fibers. When it became legal to export alpacas from South America in 1983, small herds in the U.S. and other nations became established. In recognition of their superior fiber, by the 1990's Alpacas became popular and by 2005 the world-wide number of alpacas had dramatically increased. Prices for the animals also dramatically increased. However, after the economic collapse of 2008 alpaca prices dropped significantly. Today alpaca prices have stabilized and are still heavily influenced by the quality of their fiber. Alpacas retain their reputation as high quality animals. Alpaca fleece is used worldwide in a variety of finished goods and is comparable to wool without the "prickly" and bulky factors. Alpaca fiber is washed, carded, spun and can be made into yarn for knitted and woven items such as blankets, sweaters, hats, gloves, scarves, sweaters, socks, coats, etc. Alpacas come in many different colors, including white, fawn, brown, grey, and black. Many are a solid color but some are spotted. They are intelligent, easily trained, and are often gentle enough to be handled by children. They hum as a means of communication. Alpacas are also easy to care for, and gentle on pastures. Their fiber has an absence of wool grease or lanolin that is characteristic of sheep. Alpaca fiber also retains dyes without losing its sheen and can be blended with other natural or synthetic fibers. Alpacas are able to withstand cold temperatures because of their dense fleece; it can most closely be compared to cashmere. It is hypoallergenic, lightweight, strong, incredibly warm, and very soft. As their primary purpose is the production of high quality fiber, alpacas are not slaughtered to reap their product Alpacas are shorn once a year. An adult alpaca is generally between 32-39 inches tall at the shoulders and weighs between 100-185 lbs. Alpacas have a lifespan of between 18-24 years. Alpacas have two toes and toenails on each foot. They have incisor bottom teeth and unlike other herbivores have a cartilage pad instead of upper incisors. As with other Camelids, alpacas are "induced evaluators" which means that they can be bred at any time of the year. Females start breeding at 2 to 3 years old. Their offspring, called cria, are born after an average gestational period of 11.5- 12 months; twins are a rarity. A cria birth weight can range from 12-18 pounds and a newborn can stand 30 minutes to 1 hour after birth. Female adults typically wean their cria between 6– 12 months. Human intervention and separation of mother and cria at 6 months is typical.